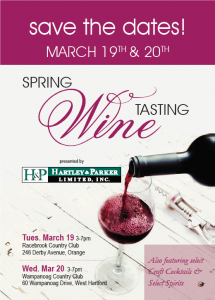 Hartley & Parker will host the first of two spring wine and spirits portfolio tastings at the Race Brook Country Club. A variety of fine wines will be available for tasting along with craft cocktails and select spirits. Complimentary h’ors d’oeuvres will be served. This is a trade-only event. Please contact your sales representative for more details.